Whether you're a newbie or a veteran, there's nothing like an all you can eat buffet to gorge on our exotic Indian food. 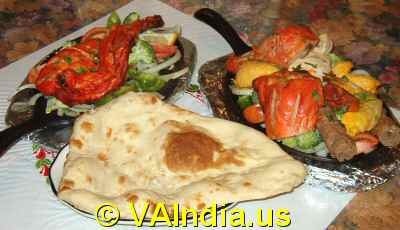 It's rare to find an Indian restaurant in Arlington, Alexandria, Chantilly, Centreville, Falls Church, Fairfax, Herndon, Tysons Corner, Ashburn, Steling, Norfolk, Blacksburg, Roanoke, Charlottesville, Virginia Beach and other towns of Virginia that does not offer at least a lunch buffet. Indian buffet meals not only provide an opportunity to taste a range of vegetarian, chicken and lamb items but also offer excellent value for money. 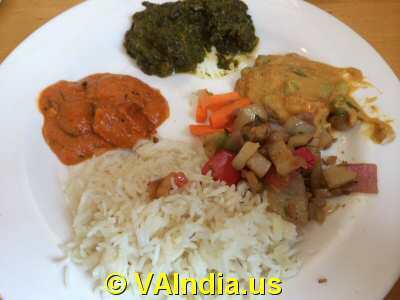 While most Indian restaurants offer lunch buffet, there are a few that offer dinner buffet and vegetarian only buffet meals as well. 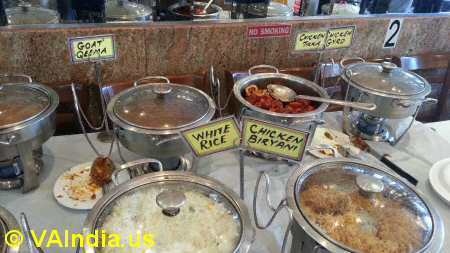 Indian lunch buffet price usually varies from $8.99 to $10.99. And the buffet lunch price goes upto $14.99 during weekends. Weekend Indian buffets are also more lavish affairs with over 30-items. 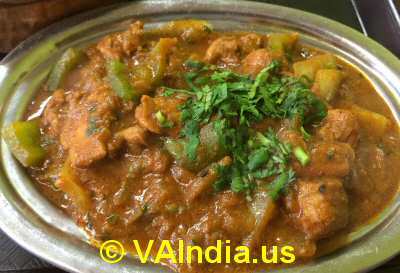 Virginia Indian buffets usually include a range of items from appetizers like Pakora, Samosa, Mirchi Bajji, Uttappam, Medhu Vada, Idly and Tandoori Chicken to entrees like Chettinad Chicken, Chicken Jalfrezi, Chicken Curry, Paneer Butter Masala, Lamb Vindaloo, Dal Makhani, Navratan Korma, Alu Gobi and desserts like Rice Pudding, Gulab Jamun, Gajar Halwa and Rasmalai. Naan bread is often served hot at the table. Weekend buffets also include Vegetable Dum Biryani and Chicken/Lamb Dum Biryani.